The neurons form the building blocks of the nervous system. The central nervous system (CNS) contains about 100 billion neurons. It also contains 10–50 times this number of glial cells. Neurons in the mammalian central nervous system come in many different shapes and sizes. Most of them have the same parts as a typical spinal motor neuron shown in Figure 2. The cell body (soma) contains the nucleus and is the metabolic center of the neuron. Neurons have processes known as dendrites which extend outward from the cell body and arborize extensively. Particularly in the cerebral and cerebellar cortex, the small knobby projections over dendrites are called dendritic spines. The dendrites are the receptive part of the neuron. 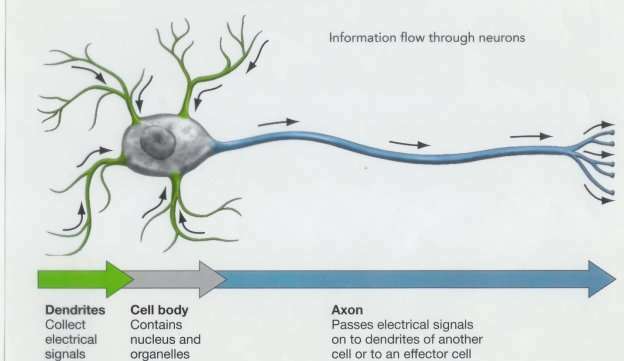 A typical neuron has long fibrous axon that originates from thickened area of the cell body, the axon of hillock. The first portion of the axon is called the initial segment. The axon divides into presynaptic terminals, each ending in a number of synaptic knobs which are also called terminal buttons or boutons. They contain granules or vesicles in which the synaptic transmitters secreted by the nerves are stored. The axonal process is responsible for transmission of propagated impulses to the nerve endings. 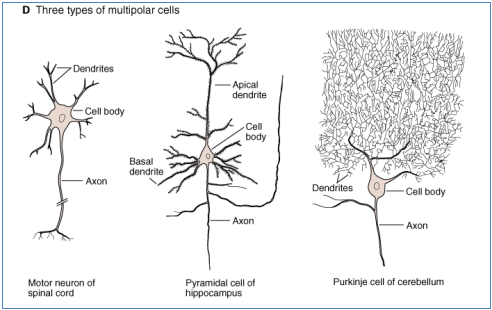 Based on the number of processes that emanate from their cell body, neurons can be classified as unipolar, bipolar, and multipolar. There are two major types of glial cells : microglia and macroglia. Microglia are scavenger cells they resemble tissue macrophages and remove debris resulting from injury, infection, and disease (eg, multiple sclerosis, AIDS-related dementia, Parkinson disease, and Alzheimer disease). Microglia arise from macrophages outside the nervous system and are physiologically and embryologically unrelated to other neural cell types. Glial cells continue to undergo cell division even in adults and their ability to proliferate is particularly noticeable after brain injury (eg, stroke). Oligodendrocytes and Schwann cells form myelin around axons in the CNS and PNS , respectively. Astrocytes are of two subtypes. Fibrous astrocytes, which contain intermediate filaments, found primarily in white matter. Protoplasmic astrocytes are found in gray matter having granular cytoplasm. Both types of astrocytes send processes to blood vessels, where they induce capillaries forming the tight junctions making up the blood–brain barrier. They send processes enveloping synapses and surface of nerve cells. Protoplasmic astrocytes have a membrane potential varying with the external K+ concentration but they do not generate propagated potentials. They produce substances that are tropic to neurons, and they help maintain the appropriate concentration of ions and neurotransmitters by taking up K+ and the neurotransmitters glutamate and γ-aminobutyrate (GABA). The axons of many neurons are myelinated, that is, they acquire myelin sheath, a complex of protein & lipid wrapped around axon. In the peripheral nervous system, when a Schwann cell wraps its membrane around an axon up to 100 times myelin is formed. The myelin is then compacted when the extracellular portions of a membrane protein called protein zero (P0) lock to the extracellular portions of P0 in the apposing membrane. The axon is covered by myelin sheath except at the ending and at the nodes of Ranvier, periodic 1-m constrictions that are about 1 mm apart (Barrett et al., 2012). In the myelinated neurons, the junction between the 2 Schwann cells is known as the node of Ranvier, where the axon remains uninsulated. The intermodal distance is the distance between the 2 nodes of Ranvier and depends upon the spacing of Schwann cells at the time of myelination. As there is no proliferation of Schwann cells later on, intermodal distance increases during the growth of nerve. Thus the fibers myelinated early have longer intermodal distance, larger diameter and wider spacing at the node of Ranvier. The nerve conduction velocity depends on the fiber diameter and intermodal distance. The larger the axon the thicker the myelin sheath and longer the internodal distance, the faster the conduction velocity. (Mishra & Kalita, 2006). Not all neurons are myelinated; some are unmyelinated, that is, simply surrounded by Schwann cells without the wrapping of the Schwann cell membrane that produces myelin around the axon. Most of the neurons are myelinated in the CNS of mammals,, but the cells that form the myelin are oligodendrocytes rather than Schwann cells. Unlike the Schwann cell, which forms the myelin between two nodes of Ranvier on a single neuron, oligodendrocytes emit multiple processes that form myelin on many neighboring axons. Nerve cells have a low threshold for excitation responding to electrical, chemical, or mechanical stimulus. Two types of physicochemical disturbances are produced and these are the only electrical responses of neurons and other excitable tissues,. local, non propagated potentials; and propagated potentials, the action potentials (or nerve impulses) and they are the main language of the nervous system. They are produced by alterations in ion channels causing changes in the conduction of ions across the cell membrane. These electrical events are rapid, measured in milliseconds (ms); and the potential changes are small, being measured in millivolts (mV). The impulse is normally transmitted (conducted) along the axon to its termination. Conduction of nerve impulses is rapid but much slower than that of electricity. Conduction is an active process it is self-propagating , and the impulse moves at a constant amplitude and velocity. The resting membrane potential represents an equilibrium situation at which the driving force for the membrane-permeant ions down their concentration gradients across the membrane is equal and opposite to the driving force for these ions down their electrical gradients. In neurons, the concentration of K+ is much higher inside than outside the cell, while the reverse is the case for Na+. This concentration difference is established by the Na+K+ ATPase. In neurons, the resting membrane potential is usually about –70 mV, which is close to the equilibrium potential for K+. In response to a depolarizing stimulus, some of the voltage-gated Na+ channels become active, and when the threshold potential is reached, the voltage-gated Na+ channels overwhelm the K+ and other channels and an action potential results (a positive feedback loop). The membrane potential moves toward the equilibrium potential for Na+ (+60 mV) but does not reach it during the action potential, primarily because the increase in Na+ conductance is short-lived. The sodium ion channels rapidly get closed called the inactivated state .In addition, the direction of the electrical gradient for Na+ is reversed during the overshoot because the membrane potential is reversed, and this limits Na+ influx. A third factor producing repolarization is the opening of voltage-gated K+ channels. This opening is slower and more prolonged than the opening of the Na+ channels, and consequently, much of the increase in K+ conductance comes after the increase in Na+ conductance. The net movement of positive charge out of the cell due to K+ efflux at this time helps complete the process of repolarization. The slow return of the K+ channels to the closed state also explains the after-hyperpolarization, followed by a return to the resting membrane potential. Thus, voltage-gated K+ channels bring the action potential to an end and cause closure of their gates through a negative feedback process. The spatial distribution of ion channels along the axon plays a key role in the initiation and regulation of the action potential. Voltage-gated Na+ channels are highly concentrated in the nodes of Ranvier and the initial segment in myelinated neurons. The initial segment and, in sensory neurons, the first node of Ranvier are the sites where impulses are normally generated, and the other nodes of Ranvier are the sites to which the impulses jump during saltatory conduction which is responsible for faster impulse conduction in myelinated neurons. The number of Na+ channels per square micrometer of membrane in myelinated mammalian neurons has been estimated to be 50–75 in the cell body, 350–500 in the initial segment, less than 25 on the surface of the myelin, 2000–12,000 at the nodes of Ranvier, and 20–75 at the axon terminals. Along the axons of unmyelinated neurons, the number is about 110. 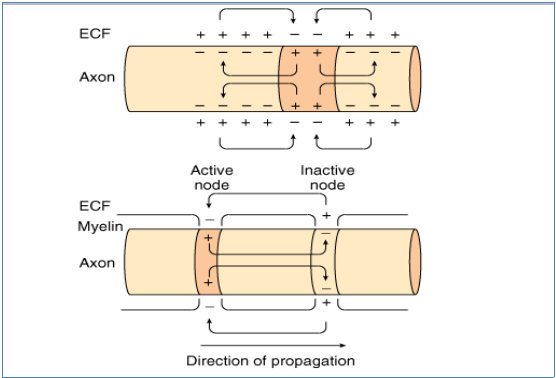 Action potential generated in axons is propagated to either direction from its site of origin. Intracellular current flows from the active zone where the inner cell membrane is positively charged compared to adjacent inactive membrane which is negatively charged. An opposing current flows through the extracellular fluid from the inactive to active region. This local current depolarizes the adjacent inactive regions, thus resulting in impulse propagation bidirectionally along the axon. The physiologic impulses, however, arise at one end of the axon i.e., the cell body or sensory terminal and are conducted only orthodromically. In pathological conditions, however, this order of conduction is not maintained. In the myelinated fibers, the conduction is much faster than the unmyelinated. In normal myelinated axons the impulse propagated by saltatory conduction. Saltatory conduction has been compared with a kangaroo travelling at speed. The action potential advance at near uniform velocity, but it is powered by discrete kicks of inward membrane current at the nodes of Ranvier. For rapid conduction, the intermodal distance should be great enough to maximize the jump of the action potential and reduce the loss of current at the node of Ranvier. In myelinated fibers the time required for the local current to excite the next node depends on the longitudinal resistance of the axoplasm, capacitance, and conductance of the intermodal membrane. With high value of these parameters, more current is dissipated before impulse reaches the next node. This results in longer time for the impulse to depolarize the adjacent node, which is responsible for the slower conduction. Myelin thickness is inversely related to internodal capacitance and conductance. Conduction velocity, therefore, increases with the increase in myelin to a certain point. In segmental demyelination or during remyelination, myelin sheath is thin, intermodal distance shorter, internodal conductance and capacitance is increased. These result in greater loss of local current before reaching the next node of Ranvier. The failure to activate the node of Ranvier results in conduction block. 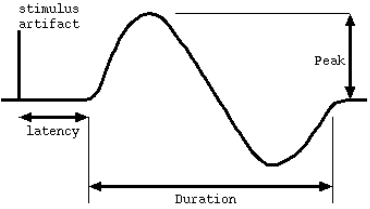 In case of a partial conduction, the impulse propagation is slowed due to longer time required by the dissipating current to generate an action potential. In segmental demyelination of smaller fibers the conduction may become continuous instead of saltatory. In NCS we apply depolarizing electrical pulse square wave to the skin over a peripheral nerve generating a proliferate nerve action potential (NAP) recorded at a distant point over the same nerve. A compound muscle action potential (CMAP) originating from the awaking of muscle grains in a destination muscle supplied by the nerve. These propagate nerve action potential and compound muscle action potential may be cited with surface or needle electrodes. Minor electrodes are restricted to allow around the full muscle stimulated, giving data for the time taken for the rapid axons to conduct an impulse to the muscle and the size of the feedback. Needle electrodes for NCS give authentic conduction time information, but because they evident from a small area of muscle or nerve it gives poor information and making numerical analysis difficult. Also it is difficult to obtain patient cooperation in an invasive technique. Nerves to be tested can either be stimulated through the skin with surface catalyst or it can be tested via a needle fixed close to the nerve or nerve roots. Choice of the stimulant depends on the desire to “bracket” above and below the point of a prospective focal contusion and the anatomical opportunity to the applicable structure. (Mallik& Weir et al., 2005). "Nerve Conduction Physiology." UKEssays.com. 11 2018. All Answers Ltd. 04 2019 <https://www.ukessays.com/essays/physiology/basic-physiology-of-nerve-conduction.php?vref=1>. "Nerve Conduction Physiology." All Answers Ltd. ukessays.com, November 2018. Web. 24 April 2019. <https://www.ukessays.com/essays/physiology/basic-physiology-of-nerve-conduction.php?vref=1>. UKEssays. November 2018. Nerve Conduction Physiology. [online]. Available from: https://www.ukessays.com/essays/physiology/basic-physiology-of-nerve-conduction.php?vref=1 [Accessed 24 April 2019]. UKEssays. Nerve Conduction Physiology [Internet]. November 2018. [Accessed 24 April 2019]; Available from: https://www.ukessays.com/essays/physiology/basic-physiology-of-nerve-conduction.php?vref=1.